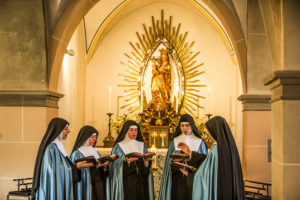 To support the work of the Institute of Christ the King, Divine Providence has brought about the formation of a community of contemplative nuns dedicated to reparation and adoration of the Royal Heart of Jesus Christ Sovereign Priest. Leading a non-cloistered contemplative life, the sisters offer their daily prayers and sacrifices particularly for the priests of the Institute and the souls entrusted to them. In June 2004, Ennio Cardinal Antonelli, Archbishop of Florence, vested the first three sisters with their habit. 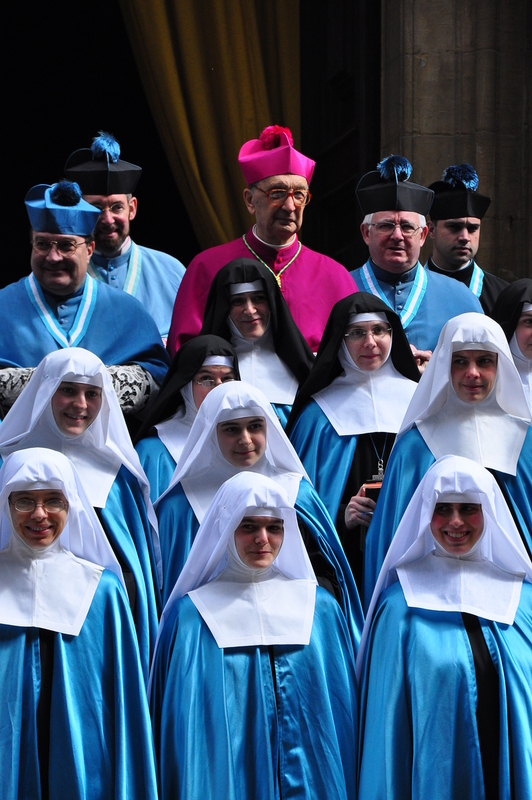 In Spring 2007, they already number nine sisters and four postulants, from France and the United States. Like the priests and oblates of the Institute, the Adorers of the Royal Heart hold three co-patrons as the guiding lights of their spirituality: St. Francis de Sales, St. Benedict, and St. Thomas Aquinas. From St. Francis de Sales’ doctrine of Divine Love, the sisters draw the pattern of their vocation: to be in constant pursuit of growth in Love, which should always be founded on Truth. The Benedictine aspect of their charism is reflected in the central place of the Church’s Liturgy in their daily life. Holy Mass and the Divine Office celebrated in the classical Roman form, form the rhythm of each day. In St. Thomas Aquinas, the sisters find the clarity and structure of thought necessary for their formation and ever-deepening understanding of the mysteries of our Catholic Faith. Finally, it is through their principal patroness, the Blessed Virgin Mary under her title of the Immaculate Conception, that they seek to conform their lives and their whole beings to the Royal Heart of Her Divine Son–thus their motto, In Corde Regis (“in the Heart of the King”). 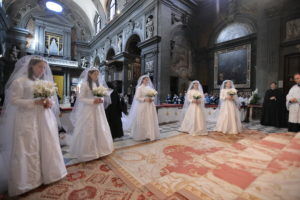 Their day is centered around prayer – Holy Mass and the Divine Office in the traditional Latin form, one hour of mental prayer and one hour of Eucharistic adoration in the evening, the Rosary, etc. Punctuating this rich life of prayer are periods of manual labor and intellectual training, including instruction in Gregorian Chant, Latin, Spirituality, Philosophy, and Theology, as well as the learning of crafts such as sewing, lace-making, and the care of liturgical vestments and altar linens. 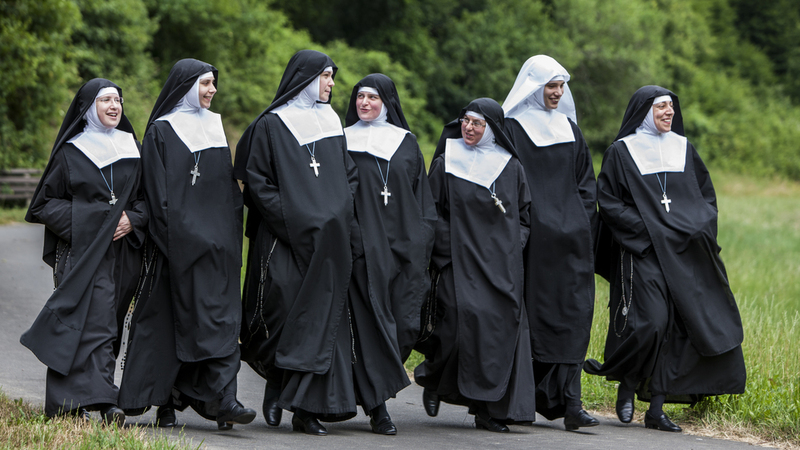 As the community expands, it is foreseen that foundations will be made alongside the apostolates of the Institute of Christ the King, where the sisters will be able to provide support for the apostolic work of our priests. 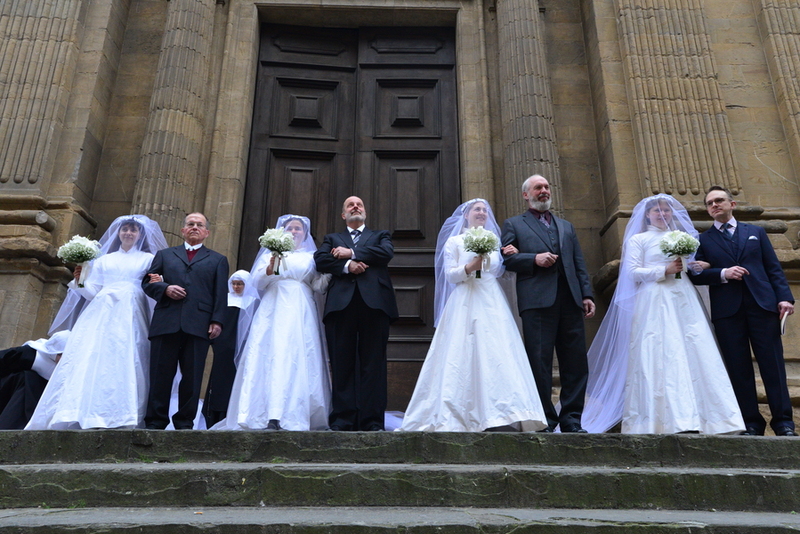 Recently, the Sisters were given a building that will serve as their future convent. At present, it is in need of extensive repair. 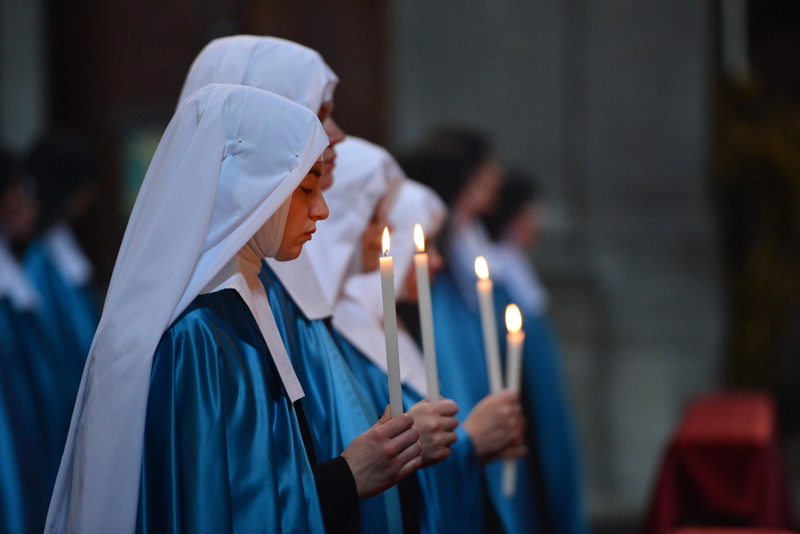 However, the Sisters are certain that with prayer, generous donors will come to realize the importance of their work. Adorers of the Royal Heart of Jesus Christ, Sovereign Priest, we are children of St. Francis de Sales, Doctor of divine Love. It is in his school that we desire to learn, by practice of the hidden virtues, to love and adore God in spirit and in truth, in response to the infinite and merciful Love that pours forth from the pierced Heart of the Sovereign Priest. It is to this Heart that we are consecrated – as our motto, In Corde Regis (“In the Heart of the King”), indicates – so that we may render glory to God and intercede most particularly for the priests of the Institute and the souls entrusted to them. Our spirituality is at the same time Salesian and Benedictine, according to the spirit of the Institute of Christ the King. The core of our spirituality is founded on the worship of God, to Whom supreme adoration is due. At the heart of the life of the Church, and consequently, of the Institute is a great love of the holy Liturgy, as our holy patron St. Benedict teaches us. Through the holy Liturgy we are led to the most Sacred Heart of Jesus, which is “the open window to the Divinity” (St. Francis de Sales). It is the Holy Liturgy which, as primary source of our spirituality, establishes the rhythm of daily life in our community. In a house dedicated to Our Lady of Good Deliverance, in the heights of Gricigliano, commanding a magnificent view of the entire valley of the Sieci region, we lead during these early years, in essence, a non-cloistered contemplative life. A priest from the seminary comes to our chapel for Holy Mass every morning, and for daily Adoration of the Blessed Sacrament in the evening. Throughout the course of the day, prayer and the recitation of the Divine Office keep us likewise continually before God in adoration. 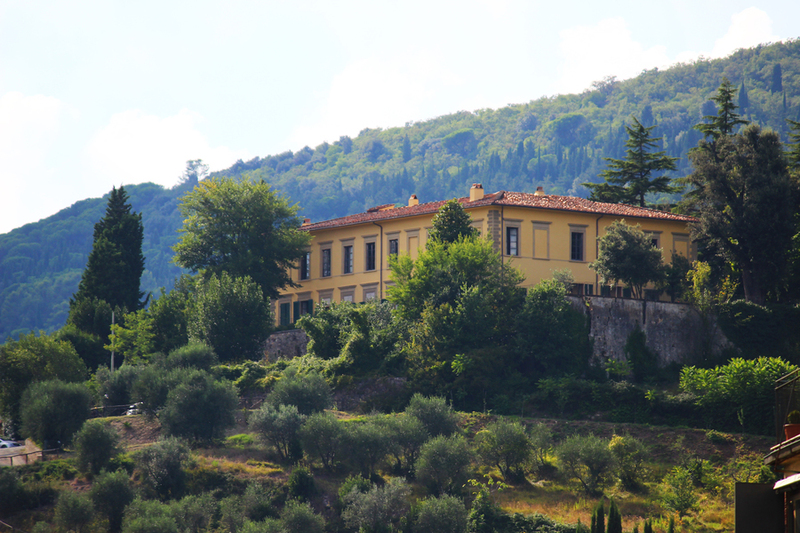 Building on the foundations established by the teachings of our third patron, St. Thomas Aquinas, we also benefit from time dedicated to study and intellectual formation. Through this life of adoration lived in the heart of the Church – life of prayer, study, and manual labor – we are ready to take on an apostolic way of life alongside the priests of the Institute, the nature of which Providence will reveal in due course. As with the entire Institute, the Holy Virgin Our Mother, under the title of the Immaculate Conception, is our principal patroness. Her Heart takes us along the luminous road that leads to the Royal Heart of her Divine Son to Which we desire to conform ourselves.